Part-time employment is defined as working less than 35 hours per week. There are 28 million part-time workers in the U.S. The main reason business owners offer part-time employment is to save money. They accomplish this in several ways. Part-time employees are often paid less per hour. Employers also save by providing fewer benefits to part-time employees. They can also reduce hours for part-timers when staffing demands decrease. Employers who view part-time employees as replaceable cheap labor are short-sighted. To tap into unrealized potential, business owners need to manage part-time employment better. Part-time employees can be valuable members of your team. They can offer much more than simply lower labor costs. Employers who withhold perks from part-time employees should not be surprised when they are resentful. It’s impossible to have an engaged workforce when there are two tiers of employees. If you want part-timers to invest in the company, you need to treat them as you treat your full-time staff. This comes from the top. If you or other employees exclude them from meetings or events, they will feel alienated. If they are forever kept out of the loop, they will become frustrated. And they won’t be able to do their jobs well. If you want your part-timers to contribute, they must feel like they are valued just as much as the 9-5ers. Your part-time employees are saving you in labor costs. They serve an important role in your organization by ensuring profitability. To succeed, you need to understand your part-time employees’ goals. Some probably want a full-time position as soon as its available. Others may not have any plans to seek a full-time position. You can score a win-win in both situations. Support your part-time employees’ long-term plans and they will be an asset to your company. A part-timer who enjoys their work and likes their schedule may become your most productive worker. A flexible schedule may be the perk that keeps them loyal. You want your part-time employees to feel valued. If they are routinely given the least desirable tasks, this won’t happen. Your part-time employees can be just as productive as your full-time employees if they are given everything they need to succeed. This includes onboarding, training, and the opportunity to perform all the necessary jobs. When you need to fill full-time positions, it is much cheaper to promote from within the company. If your part-timers have been relegated to grunt work, they won’t be as effective when given greater responsibilities. If you have high turnover among your part-time staff, it may be due to the distribution of work duties. Talk to your managers and employees to understand what’s going on. Time and attendance system analytics can help you see the big picture when it comes to workflows. They need to be able to move up in your organization. Provide adequate training and mentoring so they can advance professionally. Like any other employee. As they gain more experience and job skills, they contribute more. Transitioning a part-timer into a full-time position saves you in onboarding and training expenses. If part-time positions are a dead end at your company—your attrition rate will be higher than necessary. This can wipe out all the labor savings of having part-time employees in the first place. We’ve addressed corporate culture. Let’s turn our attention to the nitty-gritty of workforce management—time tracking and scheduling. To optimize your human capital, you need a capable automated system. Time and attendance systems are not exclusively for full-time workforces. They are also ideal for part-time employment. After all, employers have the same management tasks for all their staff members. Regardless of the number of hours they work. Before we go any further, let’s explain what a time and attendance system does. What is Automated Time & Attendance? Time and attendance systems automate the tasks required to manage employees. These tasks are necessary for part-time and full-time employees. First off, they capture punches when your employees clock in and out. Your staff can clock in with a physical time clock or through an online web portal. The clock syncs with the software. The punches record onto a digital time card. The system does far more than record and tally hours on a timesheet. Time and attendance systems have a host of tools that automate workforce management. Basic systems track employee time and import the data into a payroll system. Managers customize them to calculate vacation and sick time according to company policies. They track overtime per Federal Labor Standards Act (FLSA) guidelines. The system adjusts for paid and unpaid breaks. They have tools for custom pay rules. This is very handy for restaurants whose employees fill different roles. For example, a front-end employee works as a hostess and server. As a hostess, she earns the full hourly wage. As a server, she earns a lower wage plus tips. A time and attendance system easily tracks this. Job codes are another handy feature. If your part-time employees work for different clients—and are paid accordingly—your system can track that, also. They make it easy to bill all the different clients you are currently serving. More elaborate systems have scheduling tools. The schedule builders in these systems are more powerful than a spreadsheet. You can use built-in templates or start from scratch. Drag and drop employees into shift slots. Duplicate the schedule from month to month, adjusting where needed. Employee profiles and shift rules ensure each shift crew has the necessary qualifications. Scheduling tools are especially helpful for part-time employees at many locations. The system alerts you if you try to schedule an employee at two locations simultaneously. Time and attendance systems give managers complete oversight of their workforce. They can spot trends and prevent problems before they happen. They can use analytics to schedule for greater productivity. Scheduling practices are under scrutiny across the country. Entry-level part-time employees are especially susceptible to abuses. These abuses by some employers have resulted in a spate of Fair Scheduling laws. These laws are being enacted in states and cities around the country. Each one is slightly different but they all aim to protect employees. These laws mandate how far in advance schedules must be created and posted. They also limit “clopenings.” This is when an employee closes a business late at night. Then they must return early a few hours later to open. Small businesses that are open round-the-clock (or close to it) are the most likely to use these practices. They have a small staff to work with. They also often have thin margins. This makes it tempting to schedule clopenings and on-call shifts. This may save on labor costs, but it wreaks havoc on the lives of employees. An automated scheduling system like TimeSimplicity from SwipeClock is a must-have. It helps employers comply with any type of Fair Scheduling law. Owners set rules based on the particular law to which they are subject. It protects the employer from compliance violations. It also protects employees. When employers schedule fairly, their employees are able to focus on their jobs. Happier employees serve customers better. This benefits everyone in the end. Fair Scheduling laws are not the only compliance issue to worry about. They are just the latest. The 1938 FLSA affects many aspects of part-time employment. Minimum wage and child labor provisions are two of them. Restaurants and retail establishments often deal with both of these issues. The laws aim to ensure that “the work is safe and does not jeopardize employees’ health, well-being or educational opportunities.” (U.S. Department of Labor.) Businesses that hire minors need a time and attendance system. These systems streamline FLSA compliance. The peace of mind is invaluable for employers. Employers who violate FLSA minimum wage provisions can incur hefty fines. They also need to be aware of State or local minimum wage laws. These are often stricter than Federal wage and hour laws. Scheduling is key to minimum wage compliance. Employers who are not careful with on-call shifts or tip pooling can violate minimum wage regulations without even knowing it. Employers who occasionally schedule part-timers for full-time hours can violate overtime laws. Again, a time and attendance system is essential. Time and attendance systems have tools for FLSA, State, and local provisions. The employer-employee relationship involves a simple transaction. Compensation for time worked. Because of this, accuracy is critical. All parties should know exactly how many hours and minutes an employee works. Then the employer should pay the correct amount. This is fundamental. But it’s surprising that so many employers are lax about employee time and attendance. Hourly part-time employment without accurate time keeping is fraught with potential problems. Say an employee forgets to punch in or enters incorrect hours on a paper timesheet. This happens all the time. When it does, the whole pay process is flawed from the beginning. Employees often have to remember punch times days after the shift. People with photographic memories generally remember to punch in and out every day. People who routinely forget to punch in or out are also fuzzy when it comes to remembering punch times. You can bet that they don’t always guesstimate time in the employer’s favor. Unintentional time card padding is a problem. Intentional wage fraud is even more costly. When an employee estimates an extra five minutes, they get a slightly larger paycheck. When an employee pads fifteen minutes to a time card every single day—now we’re talking real money. Reducing wage theft is a compelling reason to use a time and attendance system. The best safeguard against wage theft is a biometric time clock paired with an advanced time and attendance system like TimeWorksPlus. More on biometric time clocks ahead. Automated time and attendance systems relieve hours of work for your HR team. They integrate directly with payroll systems. No one needs to manually enter timecard hours. Managers can approve time cards quickly. They don’t even have to collect them—they are right there in the system. Does all this capability sound too expensive? Stick with me for a minute. Because of cloud computing, these systems can accommodate any budget. Cloud computing has made time and attendance systems accessible for all businesses. Unlike legacy systems, you don’t have to fork out a large chunk of money upfront. They work like a subscription service. The time and attendance vendor hosts the software on their servers. Some business owners fear a lack of control when sensitive employee data isn’t onsite. This can actually be an advantage. The vendor takes care of security and technical support. Business owners don’t need to pay for expensive updates, either. The time and attendance vendor keeps the software secure and up-to-date at all times. A cloud-based system requires no special hardware. It is compatible with both Macs and PCs. The mobile companion apps work with Apple iOS, and Android. The business owner and managers simply access the system from a web browser. Part-time employees view schedules from any smartphone, tablet, laptop, or desktop computer. This type of centralized access brings many benefits for part-time employment. When a manager makes a schedule, all part-time and full-time employees can see it immediately. Businesses that offer part-time employment often have irregular shifts. Centralized schedule access reduces coverage gaps. Part-time employees can see schedules and changes any time of day. This centralization is bi-directional. This is useful when part-time employees want to request a shift change or extra shifts. The system has an online trade board that serves as a shift exchange. The manager customizes the shift board per company shift trade policies. Employees post their availability. They can also request open shifts. Frantic texting to cover last-minute gaps can make managing part-time employment a nightmare. Managers can approve online shift trades in real time. Managers don’t have to guess which employees want extra hours. They don’t have to pick on the same employees over and over again to cover last-minute absences. Busy part-time employees love online shift trade boards. Everyone wants more control over their schedule. Managers also love online shift trade boards. It saves them a lot of time and hassle. If your managers are overly stressed, let your employees take over shift trading. It works better for everyone. For more information on employee self-service shift trading, see TimeSimplicity. Online shift trading for part-time employment produces a dramatic improvement in morale. It’s not surprising that employees who have control are more engaged. They are also more loyal to their employers. Accommodating shift preferences is a valuable perk that doesn’t cost business owners. Happy employees serve customers better. Shift flexibility is especially important to part-time employees. Employees who work part-time often juggle school or another part-time job. Shift trading helps employers keep qualified employees. Cloud-based systems have become popular because they have many advantages over premise-based software. Some time and attendance vendors offer both types of systems. How Do Employers Pay For A Cloud-Based Time & Attendance System? Instead of investing money in hardware and IT, employers pay a fee per employee. This makes them ideal for businesses with fluctuating or seasonal part-time employment. There is no risk to signing up for cloud-based time and attendance. The systems are elastic—they fit your workforce no matter how small or large. Some time and attendance vendors don’t even make employers sign a contract. 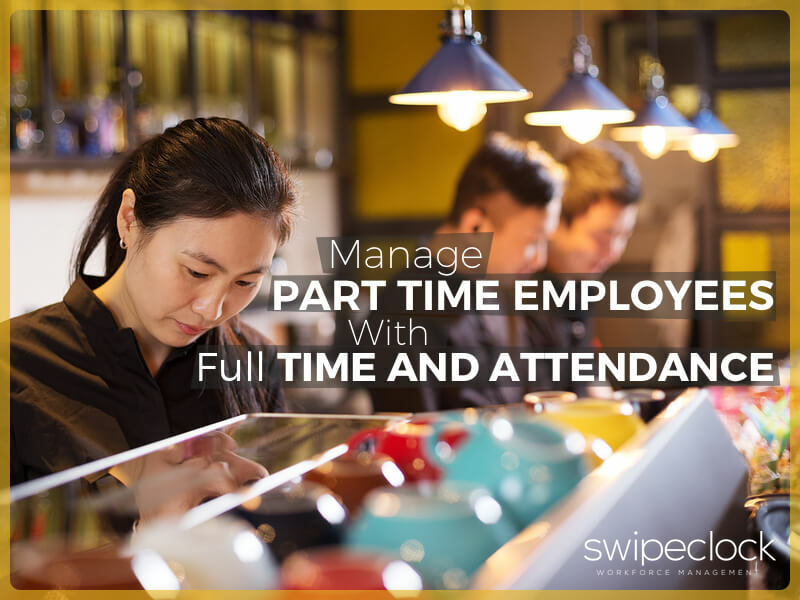 TimeWorksPlus from SwipeClock is an ideal system for managing part-time employees. It works with the most popular time clocks and integrates with payroll systems. It simplifies workforce management for industries with hourly employees. Let’s talk about the best time clocks for part-time employment. Forget old school card punch machines. They may have been state-of-the-art in 1890, but they are now obsolete. Using a punch card machine makes as much sense as using a rotary dial phone or mimeograph. We will now look at the types of time clocks available for hourly, part-time employment. The least expensive option is a web-based time clock. Employees access the clock-in portal from any web browser. They enter their password to open the web clock. Cloud-based time and attendance systems have an online portal built right in. Employers have the ability to use more than one type of clock in method. Employees appreciate the convenience of web-based time clocks. Restaurant employees can clock in from a tablet they are using to enter meal orders. Mobile workers can clock in from a smartphone. Call center employees can clock in on their desktop computer. Employers appreciate how affordable web-based time clocks are. They don’t have to buy a device. They can use every feature of the system without needing special hardware. There are a couple drawbacks of web-based time clocks. Employees sometimes forget to clock out. Managers can program alerts into to remind part-time workers to punch out at the end of their shift. Another problem is that don’t have as many time theft protections as other types of time clocks. In a company with lax oversight, an employee could clock even if they weren’t on the job. An employee can steal time even with no internet-enabled device. If he is late or absent, he can share his password with a co-worker. The co-worker can “buddy clock” for the absent worker. Web-based time clocks are best for small employers who have good oversight. They are used with success by companies in a wide variety of industries. Mobile time clocks are similar to web-based time clocks. Employees download a mobile app which tracks their time. These systems often have GPS capabilities. This lets managers know the exact location of each punch. GEO-fencing actually prevents punches if not within a prescribed geographic location. Mobile time clocks can track traveling and offsite workers better than other types of employee time clocks. Most time and attendance systems have a mobile app, though they don’t always have all the features of the complete system. Companies with remote or mobile employees can improve payroll accuracy by using mobile time clocks to track their part-time workers. Time clock manufacturers are working to meet the demands of all industries. Time clocks for non-office workplaces make accurate time tracking possible for any business. TimeWorksTUFF from SwipeClock is ideal for industrial, manufacturing and construction. It comes with a dust/shock/water-resistant case and wireless capability. The last type of time clock used for part-time employment is a biometric clock. These clocks use a fingerprint, palm print, iris scan, or facial recognition. The only real drawback is the cost. But many employers believe they are worth every penny. Small business owners who invest in biometrics often recoup the cost with reduced time theft. Because a biometric clock requires the employee’s biologic identifier, they can’t be exploited. They are also ideal for workplaces that need tightly secured access. The TimeWorksTouch time clock from SwipeClock works with the powerful TimeWorksPlus time and attendance system. It has all the latest time clock technology at an affordable price. “Employee aware” prompts eliminate punch mistakes by only presenting logical options for employees. It easily tracks paid and unpaid meals and breaks. It works with both proximity cards and fingerprints. Schedule enforcement and punch lockout make it easy to manage large teams and irregular shifts. Compliance tools protect employers in the case of a labor audit. For more information about choosing a time clock for part-time employment, see Time Clocks for Small Business. For information on tracking time and attendance for hourly part-time employment, see TimeWorksPlus.